Part of life now days revolves around reading about other people's perfect lives. 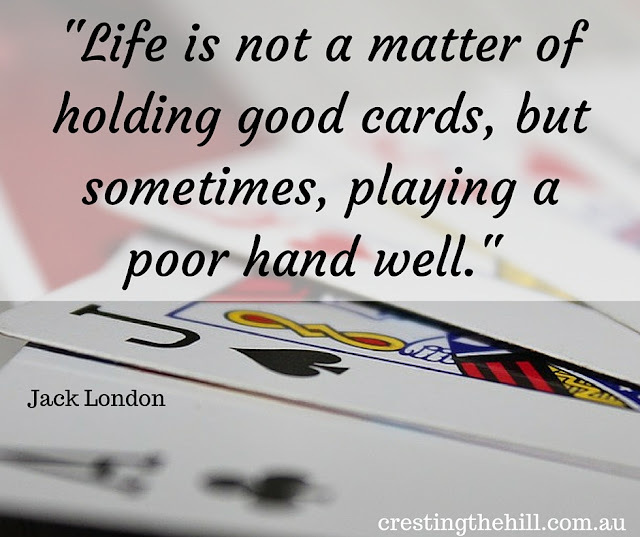 It can be celebrities or it can be friends on facebook, but wherever it is, there are always people who seem to have been dealt a very nice hand of cards. In comparison, my cards look a little on the sad and sorry side. I'm not uploading photos of my dinner or dessert taken at the latest restaurant. I'm not peppering my facebook feed with photos from my lovely overseas destination holiday. I'm not even putting up photos of a local holiday or restaurant because it's been ages since I've been on one of those too! The funny thing is that I really don't mind. I should be envious of my friends who married doctors and engineers and are living the life of Riley but I'm just not that bothered by it. There are a couple of friends who post impossibly perfect family moments that stick in my craw a little and I must admit to 'unfollowing' them - not 'unfriending' them though because they are still my friends - I just need to time when I look at their perfect lives and families. What I've found is that I might have less money than some of these people, and my house and car might be smaller, but I am just as happy as they appear to be. I am at an age and stage where my life is pretty stable and straightforward. I know who I am and what is important to me. I know who I love and who I care about and I am happy to be surrounded by those people. I like my new job, I love my husband, I like where I live and I really like having my own time and space with very few demands. Life may not have dealt me a full house but I think we have played a fair game so far and the rounds to come should be interesting too. I just hope it doesn't swap to strip poker because this old gal doesn't want to be playing the final hands in her underwear! You nailed it! That's the blessing of midlife: to know who we are and what's important to us. 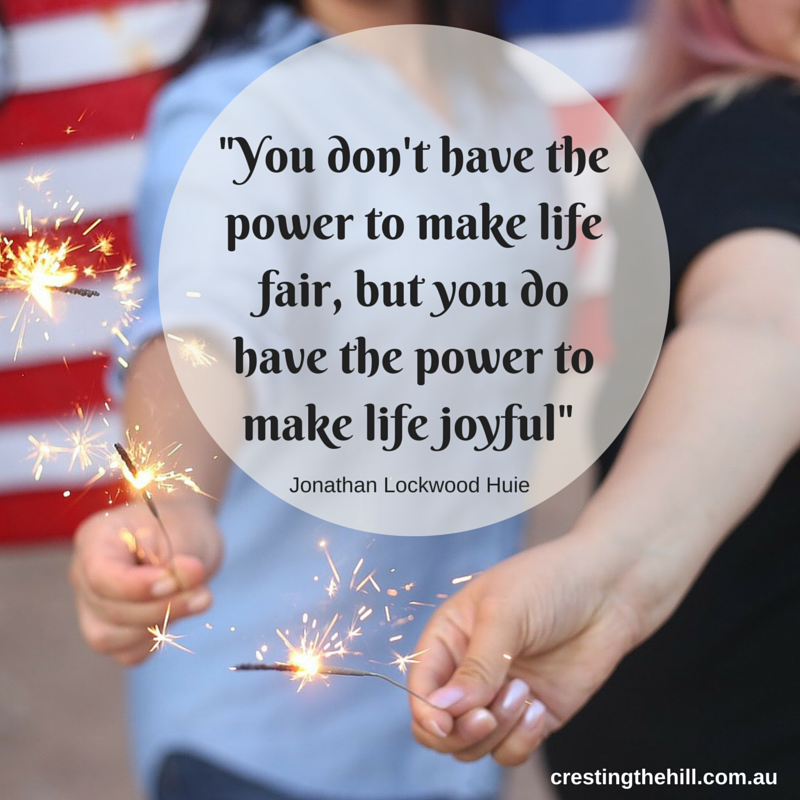 And although I love life's little luxuries and crave some of the material things out there, I realise that none of them will make me happy, plus I would never sell my soul in order to get them:) It's very inspiring and uplifting your post! Hi Abby - I think you're right in that we all like life's little luxuries, but we also know what we're worth and that we wouldn't necessarily trade what we have to get them. Leanne, Good for you to know the blessings you already have in your life! I think we are living parallel lives and that I could have written this post. 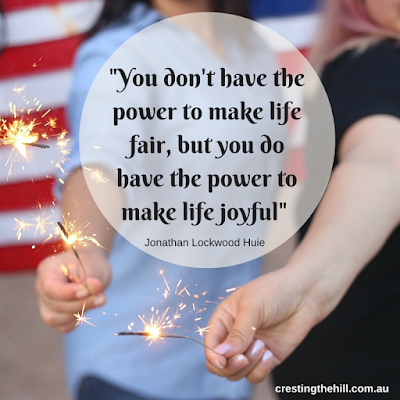 Living a positive life filled with joy and being grateful for the blessings we do have? That is what's most important in life. Great post. Thanks Cathy - I love "meeting" people who are discovering the same things as me - life is pretty good isn't it? I agree and, at times, have found it difficult to not envy those exciting vacation pics of others you talk about. Have to put it all in perspective. I wrote something similar this week too. Yes, you are so right. It's easy to forget that you can't always know what is really happening in glossy lives. I'm in exactly the same place as you are. My husband is an hourly employee in a factory and money gets tight sometimes, but we get by just fine. We're happy and in love. I am content and once I finally realized that I was no longer living for tomorrow my little part of the world got just a little brighter! actually enjoying your life now and not waiting for it to happen later is definitely a key to happiness Rena! thanks Kathy - I think it's very true that we don't know what goes on in the reality of other people's lives and we get way to glamourized a version of it all. Contentment with our lot in life is such a huge plus isn't it!